We’ve been putting food out for the birds over the winter to try and bring more to the garden. 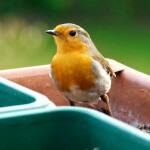 A pair of robins have become semi-tame, waiting for us each morning when they know we’ll put meal worms out for them. 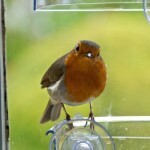 We now have a feeder on the kitchen window too that they come to. This morning I grabbed the camera and got a few quick shots. I need to play with the settings a bit, as the depth of field is too shallow but it’s amazing how close they come to us now. 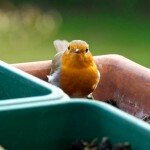 This entry was posted in Photography, Wildlife and tagged photography, Robins, Wildlife. Bookmark the permalink.